A 1980's family home, at the beach, gets a full renovation. 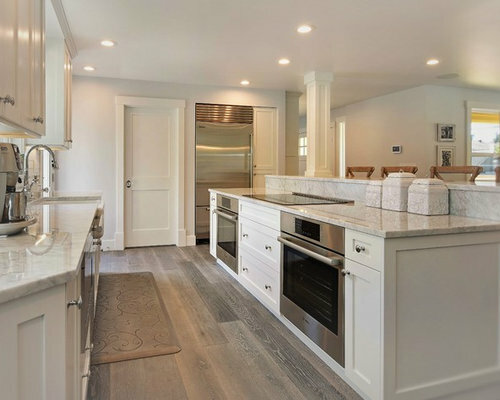 Golden oak floors and cabinets were replaced with white shaker cabinets and Pental Onixa Quartz countertops. 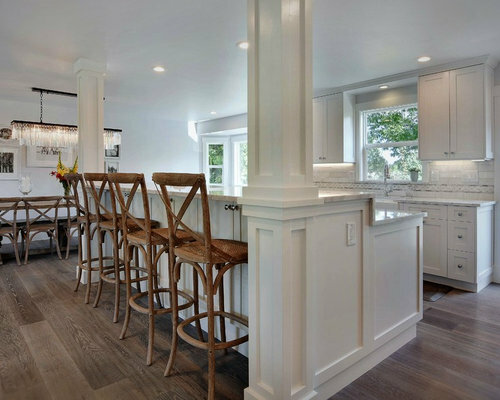 Load bearing walls are removed to create an open, comfortable space, fit for a couple, or ready to host family dinners of 15 or more. New Craftsman style double doors create an inviting welcome. 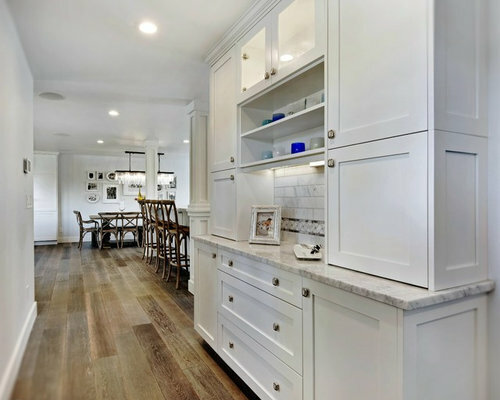 Cabinetry at the entry doubles as a service bar for entertaining. A formerly cramped pantry now houses a built in refrigerator and a walk in pantry (door profile shown center). 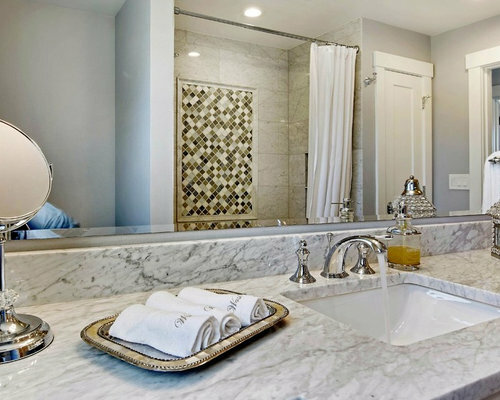 The hallway bath, accessed by two bedrooms, is updated with cool white and tones. A reeded glass window allows light without sacrificing privacy. 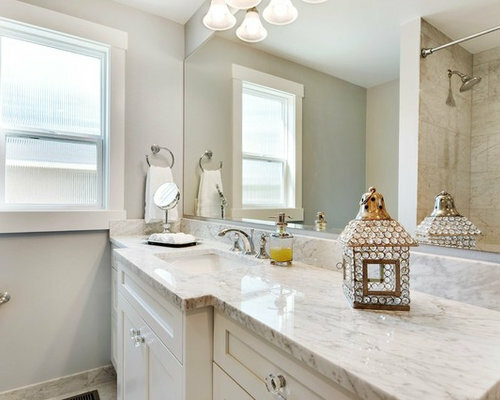 The vanity cabinets are recessed to allow for roomier circulation space, while the center is bumped out to allow for a full size sink. 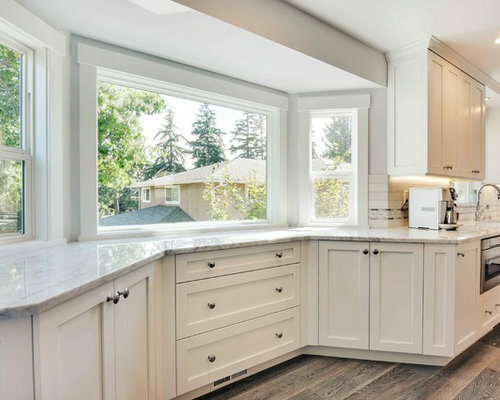 Carrara marble and white shaker cabinets are a timeless palette. Crystal knobs complete the look. 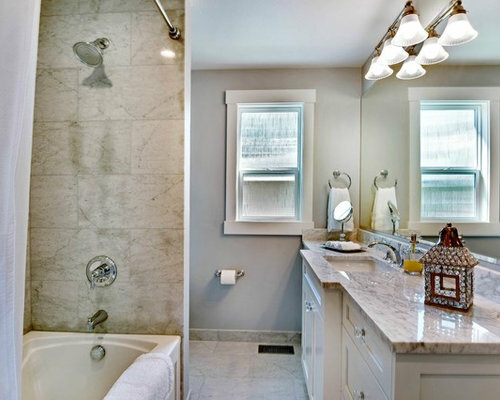 The hallway bath, accessed by two bedrooms, is updated with cool white and tones. 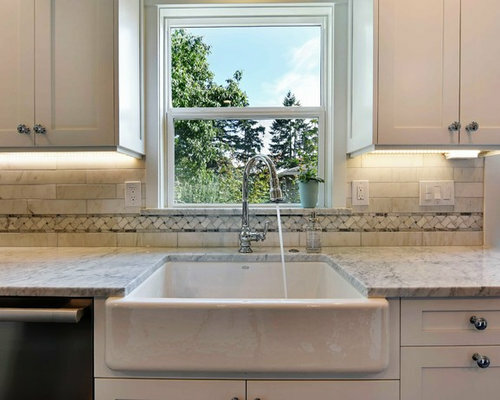 A reeded glass window allows light without sacrificing privacy. 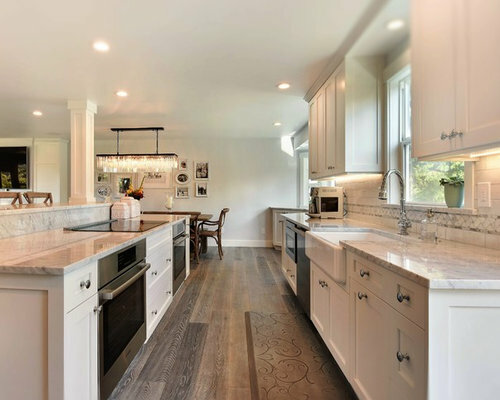 Carrara marble and white shaker cabinets are a timeless palette. Dal Tile's Arabesque stone mosaic is framed by carrara marble ogee trim at shower wall, for a timeless, classic design. The newly opened entry way contains built in cabinetry which doubles as a serving bar for entertaining. 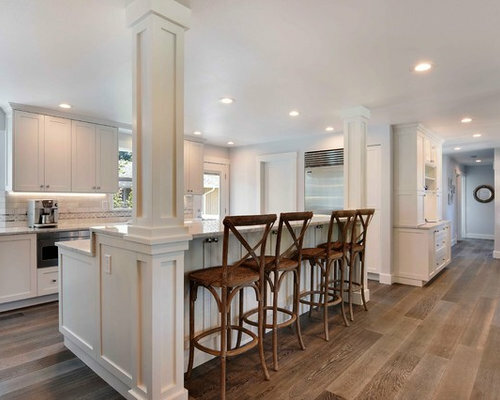 The raised bar stools and dining table chairs are seen beyond the built ins. Electronics are hidden in the lower built in cabinet. 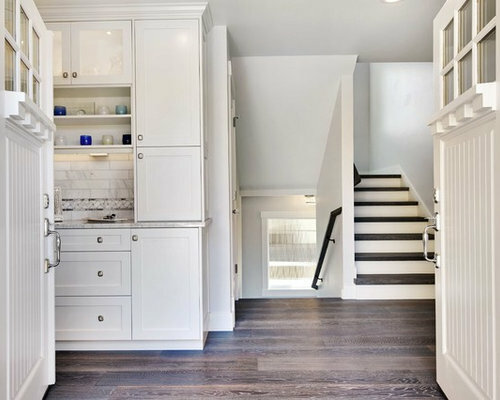 Uppers built-ins hold family games, blankets, and extra serve ware, easily accessible from the kitchen and dining room. 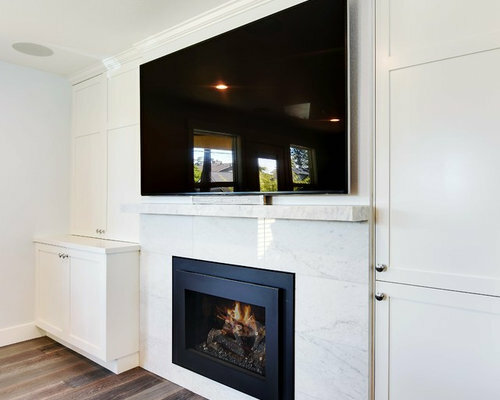 A new, sleek fireplace replaces a large, 1980's brick hearth. The TV floats above, demurely standing just 2" away from the wall. A comfortable and relaxed dining space is illuminated by a dressy and modern chandelier. The dining table seats 12 people for hosting large family dinners. A comfortable and relaxed dining space is illuminated by a dressy and modern chandelier. The dining table seats 12 people for hosting large family dinners. Family photos adorn the dining wall, in a simple and uncluttered manner. 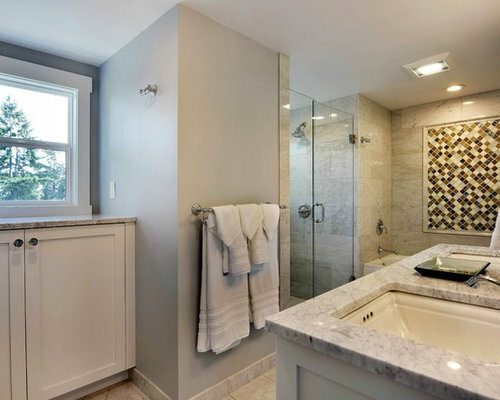 The master bathroom is made larger by annexing space from an adjacent hallway. The built in at left was formerly hallway space. The shower was unused floor space. 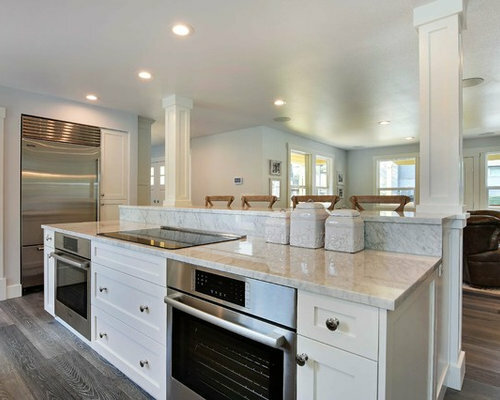 Carrara marble and white shaker cabinets are a timeless palette. Dal Tile's Arabesque stone mosaic is framed by carrara marble ogee trim at shower wall, for a timeless, classic design.